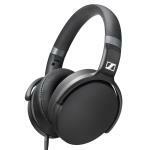 Sennheiser HD4.30G Expert Reviews - Read Reviews and Buy Smarter Online. Verdict: The Sennheiser HD 4.30G is part of the new HD 4 series launched recently in India. This new series is designed for on-the-go listening which is evident from the devices' foldable design. Verdict: It is an amazing product. It is the best product at this range. If u want to hear premium sound then u must have an amplifier. In one word this headphone is a beast. Verdict: Purchased for use with a Samsung Galaxy S7 exclusively for listening to music mp3 files @ 320kps using the Poweramp Music Player App purchased from the Google Store. Was shipped promptly and packaged very well. Verdict: Why headphones? I share a condo with a friend, who has a different schedule. I'm watching TV, or listening to music while she sleeps. Because I have some hearing loss, I tend to play everything loud. Not very considerate to my friend. These headphones take care of that issue. Verdict: We have a LOT of headphones in our house - from budget brands to Beats to Sennheiser. Our Sennheiser's are a few years old now so I wasn interested to see what these would be like. They are very nicely packaged, in sturdy packaging that prevents the earphones from getting damaged.